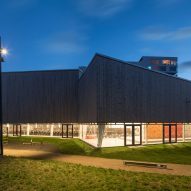 Danish studio NORD Architects has completed a multipurpose sports facility in Copenhagen's developing Ørestad City area. 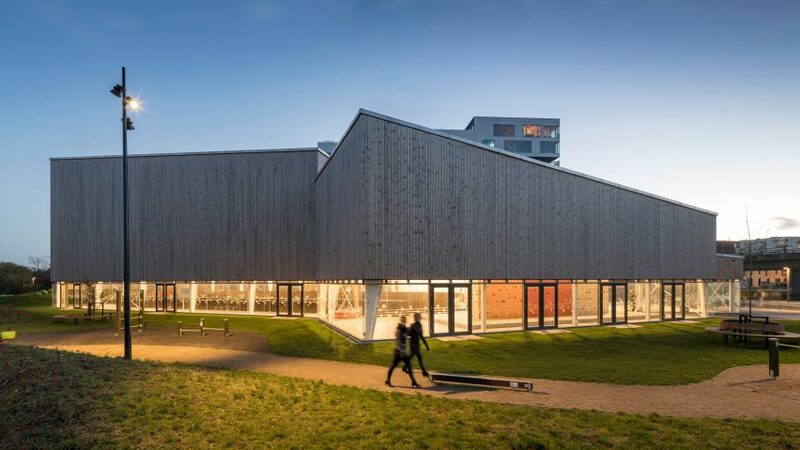 Featuring a cluster of timber volumes that fan out from a central point to define different functional zones, the building is located alongside Bjarke Ingels' iconic Mountain Dwellings complex. 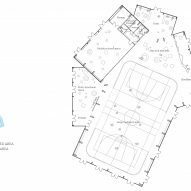 In comparison to its neighbour, the sports facility designed by NORD Architects is a modest building positioned on a plot that was originally planned to contain a pocket park. 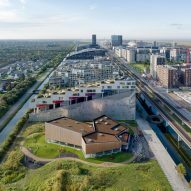 "This multipurpose building is developed and designed to be a vibrant urban space that creates new communities and social sustainability within the giant structures of the big buildings and long boulevards in Ørestad City," said Morten Gregersen, a partner at NORD Architects. 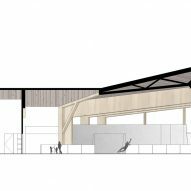 The architects conducted a series of workshops with a group of potential end users to determine the optimum programmatic requirements for the facility, which informed its flexible and fully accessible design. The building is open to the public all day and all night, providing spaces that can be used by school classes or local sports clubs for a variety of activities. 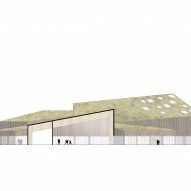 The plan comprises three rectilinear volumes with angled roofs that collide in the centre, resulting in a fractured form that clearly distinguishes the different functional areas. Internally, the space is largely open so it can be used flexibly. Only one of the three volumes is partitioned from the rest of the interior, providing privacy and acoustic insulation if needed. The enclosed room is also the only part of the building that is heated, allowing it to be used as a meeting room or cafe, or as a studio for dance, yoga, martial arts and other small group activities. The main multifunctional space is large enough to be used for team sports such as basketball or football. Alternatively, it can also host community events such as flea markets. A permanent climbing wall for bouldering is installed on the end wall of one of the three arms. Its brightly coloured panels stand out against the otherwise muted monochrome interior. 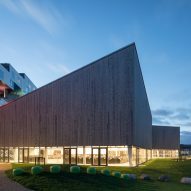 "This place is a kind of shelter for local sports and social events, and in this way is an invitation to both creativity, activity and recreation," added NORD Architects partner, Johannes Molander Pedersen. "It is built as a light structure that welcomes openness and unpredictability in this otherwise fully planned urban area, and we are sure it will generate social interaction and liveability in Ørestad City." The entrance is incorporated into the lowest point of the building to give it a more human scale that ensures it feels welcoming to the local community and passers by. 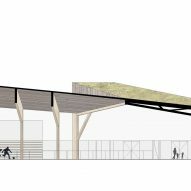 A band of glazing that extends from the entrance around the base of the facility allows views into the activity areas from the surrounding park. 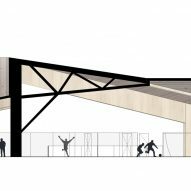 All of the surfaces above the glazing are clad in vertical timber boards that lend the structure a homogenous aesthetic so it seems to have no discernible front or back. The wooden cladding complements the natural setting of the park and is topped with a planted roof that introduces additional greenery to the area. Ørestad City is a government-subsidised district outside Copenhagen, connected to the city and Malmö in Sweden on the other side of the nearby Øresund Bridge. The first office building in Ørestad was completed in 2001 and the neighbourhood has evolved gradually since then, with significant projects including the VM Houses apartment buildings designed by Ingels and Julien De Smedt, and the leaning towers of the AC Hotel Bella Sky Copenhagen by 3XN. 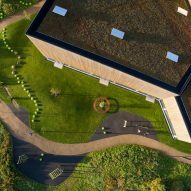 NORD Architects has previously completed a hospice for palliative patents featuring golden facades that curve around a series of quiet courtyards, and has designed a marine education centre in Malmö with a large roof that overhangs an external aquatic learning space. Photography is by Adam Mørk.